Renowned Italian natural mineral water brand Sanpellegrino will add a sustainable sparkle to its drinks with the addition of Scania R 410 liquified natural gas trucks (LNG) by its logistics partner, Koinè SpA. Gruppo Sanpellegrino in 2018 produced 1.5 billion bottles of mineral water, exported to more than 150 countries. Replacing diesel trucks with the new 13-liter LNG trucks, all of Gruppo Sanpellegrino’s shuttle transports from the mineral water bottling plant at San Pellegrino Terme to its logistics centre at Madone are now operated on gas fuel. Growth over the past years has been strong and continues to increase. Sanpellegrino will this spring start construction of a major extension of its production facilities. That means more transports on the narrow winding roads through villages in the Bergamasque Prealp valleys to and from the springs. Each day, there are 300 truck movements to the production plant, around the clock, all days of the week. In view of rising production, Sanpellegrino and its logistics partner Koinè therefore initiated discussions with Scania on finding a more sustainable solution. “These liquified gas trucks constitute an important element in ensuring the continued development of our operations,” says Maura Sartore, Head of Supply Chain South Europe, Nestlé Waters. 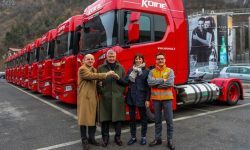 “The gas delivery to Sanpellegrino with Koinè once again highlights the importance of pursuing a novel approach in addressing sustainability and acting together to speed up the transition to a sustainable transport system,” says Franco Fenoglio, Managing Director of Italscania. Koinè has in total taken delivery of 50 Scania R 410 liquified gas trucks, most of which will be used in operations for Sanpellegrino. Interest in using liquified gas in heavy truck operations in Italy is rapidly rising and there are presently 39 filling stations for liquified natural gas (LNG) in the country with an additional 25 stations under way.